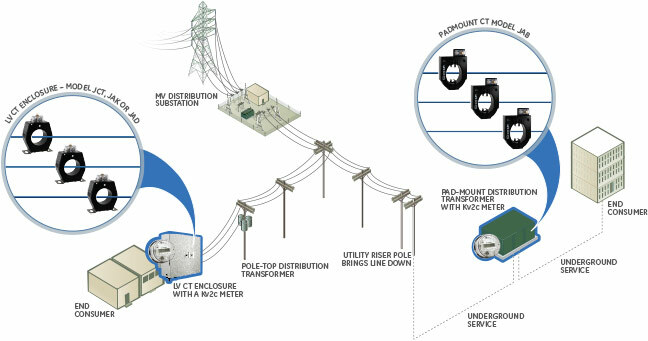 RevenueSense™ Current Transformers offer electrical utilities both extended range and high accuracy to reduce electrical losses and increase revenue metering accuracy. RevenueSense wide range, high accuracy CTs are designed for commercial and industrial applications. RevenueSense substantially reduces inventory, complexity and improves standardization for meter shop operations, particularly when used with GE’s kV2c FITZALL™ transformer rated meters. Encompass and RevenueSense CTs provide flexibility for commercial and industrial applications, indoor or outdoor service and bar-type or window-type configurations. 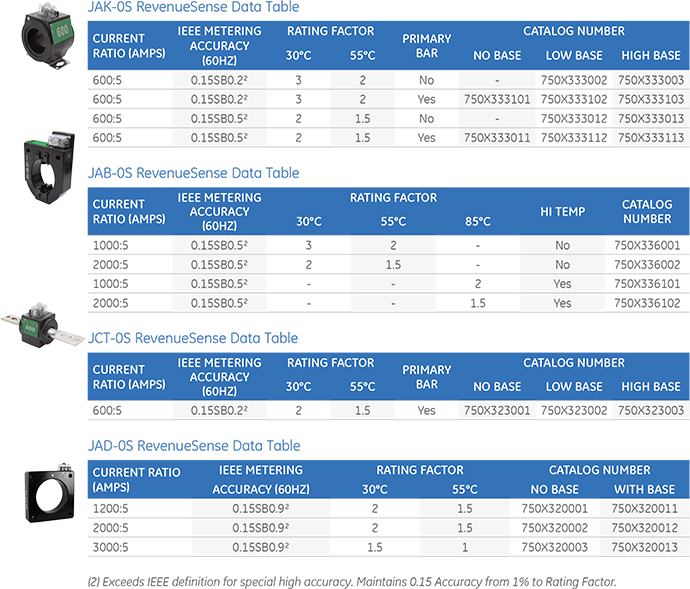 Per IEEE C57.13.6, a 0.15S class CT must maintain 0.15 accuracy from 5% of rated current through rating factor. This is a significantly tighter tolerance for error as compared to a standard CT: 2X better within rating factor and 4X better at light loads. 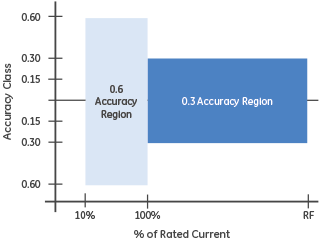 With GE’s RevenueSense CT’s, this tight tolerance of 0.15 accuracy is maintained for an extended range of 1% of rated current through rating factor. Similar to Encompass CT’s, moving from a standard CT to a wide range CT allows for a reduction in inventory, part numbers, and billing multipliers. However, where Encompass CT’s offer equal performance over an extended range, RevenueSense CT’s offer improved high accuracy performance, allowing for increased billing accuracy and increased revenue. The RevenueSense CT with rated range from 1% up through a rating factor of 3 covers the operating range of up to 8 other standard ratios, allowing for up to 90% reduction in inventory requirements. 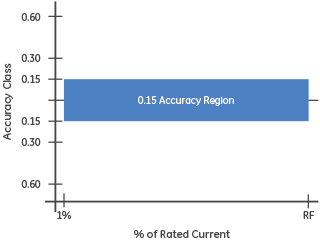 Additionally, the tolerance for CT error is tighter over the entire range, allowing for improved metering accuracy, particularly at light loads. In this business case example, a commercial customer requires premium accuracy to maximize billing revenue. The assumed hours of operation for this business are Monday to Friday, 9am to 5pm. The business is closed weeknights and weekends. The RevenueSense CT, with its premium accuracy increases billing revenue by $40.93 annually versus the standard CT. The additional cost of three high accuracy CT’s is roughly $60 in this example, yielding a payback in less than 18 months.